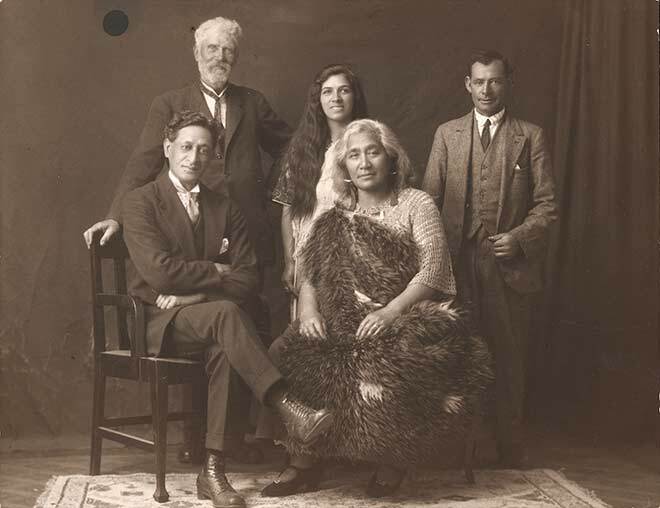 Image: Niniwa-i-te-rangi (seated, right) married three times; her last husband was Tamaihotua Apora (seated, left). Standing behind the couple are, from left, Henry Matthew Stowell, Mrs Tomiri Te Awa, and Alf Needham. Niniwa-i-te-rangi, often known as Niniwa Heremaia, was born at Oroi, on the east coast of Wairarapa; the date of her birth is said to have been 6 April 1854. She was the eldest surviving daughter of Heremaia Tamaihotua, also known as Ngapuruki, the leading chief of Ngati Hikawera of Ngati Kahungunu. Her mother, Ani Kanara, was one of Heremaia’s three wives. Niniwa may have been taught to read and write by Hirini Taraawauhi, a schoolmaster. Her eldest cousin, Wi Hikawera Mahupuku, himself a teacher, may also have had a hand in her education. As a girl Niniwa lived at Whatamanga in Wairarapa. Hikawera was recognised as the most talented of the rising generation and was deputed by his elders to conduct the affairs of the hapu. Niniwa grew up during the time he was developing Waikoukou as the sheep station of Ngati Hikawera and taking an increasing role in the management of the hapu’s other affairs. In the 1860s Niniwa’s father took her and her younger sister to live on their mother’s lands at Akura, to establish their claim there. In the early 1870s Niniwa became the wife of a European, whose name is not recorded. In 1874 the couple moved to Kehemane (Tablelands), built a house and enclosed 30 acres of land. Shortly afterwards Niniwa abandoned her husband and ran off with Kawana Ropiha (also known as Kawana Hunia) of Muaupoko and Ngati Apa. Hikawera followed them as far as Wellington, remonstrating that Niniwa had been stolen, but she spent the next 10 years in the Rangitikei district with Ropiha. She returned with him about 1885 to Kehemane. There she found her cousin Tamahau Mahupuku occupying her property, quarrelled with him, and drove him out. Niniwa was temporarily reconciled with her cousins during the years 1885 to 1888. Hikawera recognised Niniwa as the leading woman of her hapu, and entrusted the hapu’s treasures, two greenstone mere, to her care. But in the years of her absence her father had become blind and bed-ridden. Niniwa later alleged that he was drinking heavily, and that Hikawera was paying his bills to keep him dependent. Out of this situation developed the bitter family and hapu disputes over Te Poraka-nui-o-nga-waka-a-Kupe, a huge block of land consisting of some 62,700 acres between Greytown and the east coast, usually called Nga-waka-a-Kupe. It was first adjudicated in the Native Land Court in 1890. Ngati Hikawera, whose case was conducted for them by Paratene Ngata, were awarded the major shares in Nga-waka-a-Kupe, and also Parororangi, Hau-o-koeko, Tahuroa, Wainuioru and part of Rangataua. While this was a great victory for Ngati Hikawera, Niniwa was not satisfied. She had asked Hikawera and Judge Alexander Mackay to set aside 500 acres for her at Kehemane. When they refused she co-ordinated protest against Hikawera’s subdivision of the land, and successfully applied for a rehearing, held on 26 January 1891. This rehearing was one of the most bitter battles ever fought in a Wairarapa land court. Niniwa alleged that Hikawera had failed to distinguish between his own and hapu property, and had mismanaged both sheep and funds. She tried to drive a wedge between her two cousins by bringing up past quarrels, alleged that Hikawera had influenced Heremaia against her and robbed him of his mana, and revived an ancient feud between their respective grandparents. In return Tamahau successfully showed that Niniwa had savagely quarrelled with her father. In the judgement, given on 13 April 1892, Niniwa’s behaviour was severely censured, but she benefited materially. She was awarded a 25-acre share of Uwhiroa, and was included among the owners of a 1,053-acre Ngati Hikawera reserve created at Kehemane. She also received a 1,000-acre share of Nga-waka-a-Kupe. Altogether she was awarded one-eighth of her father’s share. Niniwa’s land court battles did her no harm in the eyes of Tamahau, however. It was evident that her abilities as a speaker, her knowledge of genealogy and tradition, her force of character and forthright outspokenness qualified her for a leading position in Wairarapa. By 1894 there was peace between them, and as Tamahau continued to expand the role of Papawai as a political centre, he turned to Niniwa for help. At Christmas that year he successfully proposed the setting up of women’s committees in Wairarapa. Niniwa was a member of the first of these, Te Komiti Wahine a Hinehauone (or Hinehauore). This and three other committees were responsible for much of the huge preparations begun in September 1896 to host the Maori parliaments of the Kotahitanga movement at Papawai in 1897 and 1898. Niniwa set up and was one of two treasurers of a committee to support the Maori language newspapers, Te Puke ki Hikurangi and Te Tiupiri. Her husband, Kawana Ropiha, was chairman and her mother was a member. Niniwa was the editor for women’s affairs, and also decided which items of foreign news from English-language newspapers should be translated and included. In numerous letters printed in the two papers she solicited financial support for them, announced meetings at Papawai and elsewhere hosted by herself, and discussed topical issues. After Tamahau Mahupuku’s death in 1904, Te Puke ki Hikurangi was published under the authority of a group headed by Niniwa as owner. That year, in a total reversal of her attitude in 1891, Niniwa published a long tribute to her cousin. She interpreted the Maori Councils Act 1900 as the resolution of the struggle for Maori sovereignty which had guided his career. She also gave him credit for the resolution of the Wairarapa lakes dispute, which she regarded as the cause of 30 years of tension between Maori and Pakeha. In November 1904 Niniwa sponsored the production of the Maori Record, an English-language newspaper devoted to the advancement of the Maori people, edited by R. S. Thompson. It reviewed Maori land and other grievances in the light of government policy. Niniwa’s involvement was brief, however, possibly because she disapproved of the paper’s anti-government tone. From the late 1890s Niniwa-i-te-rangi carved out a unique position for herself. She was considered a leader of Maori affairs alongside such figures as Wi Pere, Henare Tomoana, Paratene Ngata and Tureiti Te Heuheu Tukino. She was the only woman whose views were sought when the Native Affairs Committee inquired into the Native Lands Settlement and Administration Bill of 1898. She regularly spoke on the marae in a district in which this was not a common practice. She became known around the country, beginning in the days when Tamahau sent her out as Papawai’s ambassador to solicit attendance at the Maori parliaments. Her knowledge of whakapapa and tradition was extensive and contributed to the work of the Tane-nui-a-rangi committee, set up by Tamahau to record Maori tradition and genealogy. Niniwa was involved with the work of this committee, but was not a member. Probably about the turn of the century, after the death of Kawana Ropiha, Niniwa married Tamaihotua Aporo. This marriage, like her others, remained childless, although Niniwa adopted her husband’s daughter. Throughout her adult life she adopted at birth a number of children, whose descendants regard her as their ancestor. In the twentieth century Niniwa continued the Mahupuku tradition of horse-racing, and developed an interest in motor cars. Her influence expanded from Wairarapa; she was known in Hawke’s Bay and the Bay of Plenty, and lived for a time at Lyall Bay in Wellington. In old age she was cared for by her niece, Martha Hirini, the only person permitted to enter her bedroom or give her water. Niniwa’s finances became very complex, and at her death her estate was large but encumbered with debt. She died of heart failure on 23 March 1929 at Greytown, and was buried at Hikawera.